Pass beneath Tower Bridge while marvelling at the city's world famous landmarks, spectacularly illuminated along the banks of the river. See London at its very best by spending New Year's Eve in style on board the replica paddle steamer the P.S Dixie Queen, London's largest and most recognised passenger boat. Following a specially created celebration buffet, relax inside the vessel's beautifully decorated, atmospheric interior and take in the spectacular views available from its spacious windows and open air deck. Immerse yourself in a wealth of entertainment. With a live band the party on the dancefloor never stops, except to celebrate the big countdown at midnight! What's more, you'll have the experience of a lifetime as you pass under the spectacularly illuminated landmark, Tower Bridge, on your journey through the heart of London. 00:00 - Welcome in 2019! Location: Butler's Wharf Pier is located on the south shore of the River Thames, situated on the Queen's Walkway approximately 50m down stream of Tower Bridge. Absolutely fantastic. The staff were great. The boat was fully equipped with bars cloakrooms toilets etc. Food excellent. We had a great time. Very good organisation, super good service and perfect atmosphere. Please keep up the good work! We had such an amazing time on the boat for New Year’s Eve, great food, great music, we will definitely do this again! Great trip. Thank you we had a lovely time. Its just superb!!! Please note: Given that this event is a buffet cruise there will be limited seating on a non-allocated basis – i.e. there will not be seating for all passengers on board. Please note that this cruise is accessible for wheelchair users. If any of your party requires wheelchair access please contact us prior to your booking. There will be a cash bar available during the event. Debit and credit card machines are available, however due to the nature of the cruise guests are advised to bring cash as the number of card machines are limited and sometimes lose signal depending on the position of the vessel on river. Please Note: The centre piece of your celebrations onboard the Dixie Queen take place beneath Tower Bridge. The raising of this iconic landmark to mark the start of 2019 provides a truly memorable moment during your starlit cruise through the city. Please note that due to Tower Bridge's location on the Thames, views of the fireworks display above the London Eye will be limited. The sheer size of the Dixie Queen means it is unable to cruise further up the river, towards the fireworks, as a result of low bridges and high tides. Tower Bridge will rise at 23:30. 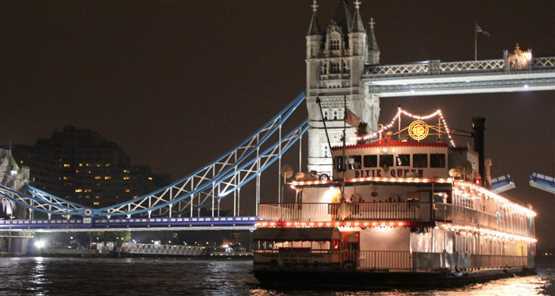 From approximately 23:30 to 00:30 the vessel will be positioned between London and Tower Bridge (opposite the HMS Belfast). Age restrictions: The entry process will require everyone to present ID, regardless of their age. All guests need to be aware they need ID and have it in their hand prior to reaching the front of the queue, together with their printed e-ticket.